Online web application service for surveys and audits linked with NK-SHIPS information. e-Application is an online application service for class surveys and statutory surveys of ships in service, ISM/ISPS ships audits, MLC shipboard inspections, and ISM company audits. 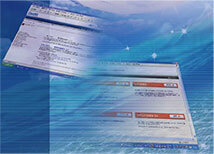 Since e-Application links with NK-SHIPS, applications for necessary surveys can be easily made using NK-SHIPS. Please refer to the e-Application pamphlet found below for more details. For customers using our “NK-SHIPS” service, this system is available from the “e-Application” link displayed after logging into “Web Service Portal” by using the USER ID and password of “NK-SHIPS”.